Freeze protection is probably the most obvious application range for heat trace tape and cable. The applications are vast in number throughout the geographic region where real winter comes every year. Pipes, valves, tanks, vessels, conveyors and other equipment are all vulnerable to excessively cold conditions. Properly configured heating cable, blankets, or other shapes can reduce the risk of freezing liquids and keep protected items at safe operating temperatures. 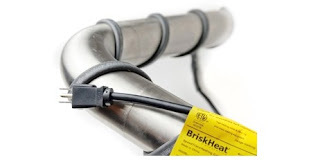 Though freeze protection heating equipment and materials are available in many shapes, forms, and materials, this article will focus on self-regulating heating cable. There are two basic types of heating cable. Constant wattage cable provides continuous full output whenever energized. It's application requires some means of limiting the temperature of the heated object. This can be a thermostat, or some other temperature controller and sensor combination. This simple on/off control is effective in many cases. More sophisticated arrangements can be accomplished with heater power controllers and a closed loop control system. The objective is to apply only as much heat (and energy) as necessary to prevent freezing or other cold induced undesirable conditions. Self-regulating cable is designed and fabricated in a manner that reduces the heat output of the cable as its temperature increases, providing a built-in means of limiting applied heat without the need for any other means of control. Properly selected and installed heat cable of the self-regulating type will apply only the heat energy needed to maintain the desired condition. No other devices are required. There are many heating solutions available for freeze protection to suit any application. Share your process heating and freeze protection challenges with product application specialists, combining your process knowledge and experience with their product application expertise to develop effective solutions. BriskHeat manufactures a broad range of heating equipment and componentry. Their heat tape is routinely applied across many applications involving heating of gases, liquids, and solids. The video included below provides simple and well illustrated guidance for selecting and properly installing heat tape to provide for safety and longevity. Heat tape is flexible in its application, inexpensive, and easy to use. The video shows the three basic types, along with their application limitations and basic selection criteria. Instruction is provided on how to properly prepare the installation surface. The tools and materials needed for installation are also shown. Share your process, pipe, and valve heating challenges with application specialists. Combining your process or application knowledge with their product expertise will produce a good match between product and application.